YGD found this idea on Facebook and immeadiately thought of me. So I had a go and took a pic. You may have seen this idea already, but I needed to share it in case you haven't, as it is SUCH a good idea! We Have FINALLY collected all the hens into the orchard and new Uber-run, so that I can finish planting. Hurrah!!! So today in went the bean plants - Runners - Scarlet Emperor, Moonlight, Firestorm and Prizewinner. Climbing french bean - Blue lake. Heritage climber -Lazy Housewife and some Borlotti. As I finished the rain came pouring down, which saved me watering the plants in! I made fleeting mention of the gooseberries not being ready last week and earlier in the year showed a pic of gooseberries being scrumped by Sky the lamb. Today I found that we have a far greater threat to the goosegogs... Chickens ! They have completely stripped the berries from the three large fruit garden plants. Thank goodness they didn't get access to the six bushes in the paddock garden and are now safely away in the orchard. I have to decide now wether to make jams or sell the berries - I usually have enough for both. 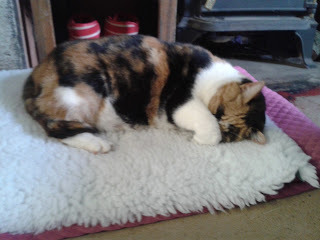 For no particular reason other than I love her lots, here is a picture of our cat Dixie on her new furry mat. I have no idea where it came from - it just arrived with some materials given to me I think. Whatever - Dixie LOVES it! 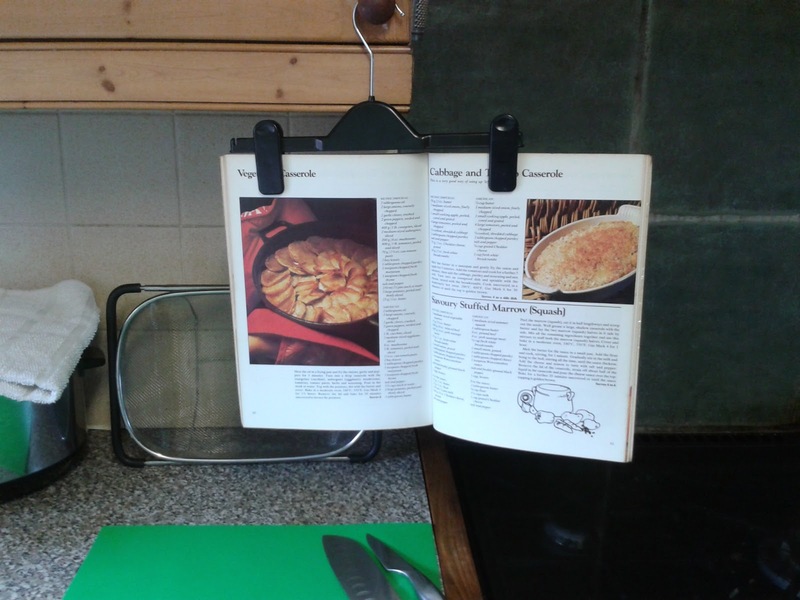 Good idea re recipe hanger. Hope you have enough g.gogs left. I picked and sold or froze 200lb last year!! and there are even more this year. Crikey ! that's a whole lot of Goosegogs. What type do you grow? had another goosegog disaster today. Please look at my next blog (when I have done it! )and tell me what you think. great idea for your recipe book, saves spills and splashes. I can't believe I hadn't thought about the paper holder.. it's such a good idea isn't it? Dixie IS cute. trouble is half the village thinks so too and she gets lots of titbits from folk.. hence her wide girth !! Great idea for the cookbook; I am going to try that later - would also work for the recipes I have on pieces of paper. You are amazing - would love to see pictures of the party ! You have given me much needed inspiration since you started this blog. I love it when it rains just after you plant. Much better for the plants too. We have a 40% chance of rain today so I am keeping my fingers crossed. OUr rain in Illinois comes in the form of storms during the summer - not much gentle rain. I figure we need about four or five more big ones and we are golden ! Cats always find the warmest most comfortable spot in the house, thats one thing I love about them. I shall make sure that there are some pictures of the party if people are interested. I keep reading about increased rainfall all over the globe at the moment. But then there seems to be so much energy in the weather whatever it is doing. I think it is a truism that cats ruke the world!! Hello all I'm back ! Of Pallets and a Surprise "Visitor"